Welcome to Lumberjocks, Looking forward to seeing what you make from that Oak and the Black Walnut, but I dry my own wood also and know that it takes a lot of patience. Best of luck in your woodworking adventures. welocme to LJ and good to read the passion. think about how much that limb weighs- its been growing with all that weight and getting heavier as its grown. its been sagging and growing bigger and bigger, getting a lot of stresses built up in it. on that oak- and any other tree, limbs dont make very good lumber. as they grow, they get stresses growing into the wood. sometimes while cutting up limbs that size with my chainsaw the stresses were released and my CS bound up. if something like that makes it to the mill, those internal stresses can be released during milling and wreak havoc. if the wood makes it through the mill and is stacked to dry, the stresses can come out as the moisture leaves the wood. i have milled some limb wood before and had it stacked in my shop. a month or so into the drying, i was out there and a pretty loud CRACK scared the crap out of me coming from the pile. one of the boards had split end to end and then had 2 banana boards. IF limb wood makes it through the drying process, the internal stresses can come out when machining. im sure theres more than me here that has been riping lumber and had it close up and pinch the blade or even start opening up drastically, only to have ripped some high priced kindling. ive also had limb wood that ive ran across the jointer to flatten and planed to width, only to find it warped,buckled, cupped and all that fun stuff the next day. IF it makes it through ALL of the processes and ends up in a piece of furniture, its possible for those stresses to show up down the road. not tryin to be a downer here, but i found it a waste of time to try and mill limb wood. I’ve had a lot of wood milled by a local guy – white oak, red oak, cedar, and cedar elm. Some was from big limbs, though most was from the trunk. Likely that there is stress in the wood that you have , but I’d mill it anyway. Have it milled thick, like 1.5 inches. Put it on stickers and wait 18 months and then put it to work and see how it goes. I sure wouldn’t pile it up and burn it just because it might be tough to work with. I have some really cupped and twisted walnut and oak, but I can use it on small projects like boxes. Having it milled thick will cause you to waste some wood, but at least will allow you to remove enough wood to correct cupping and twisting and still leave you enough wood to work with. Good to know! I didn’t think aboutw how the limbs growing like that would cause stress and energy build up. I’ll go ahead and have it milled anyways just so I have more lumber. I actually cut up all of a fallen oak tree this last winter, so I’ll have a good sized trunk piece that I can make my primary source of lumber until I can cut down some more trees in the next year or so. 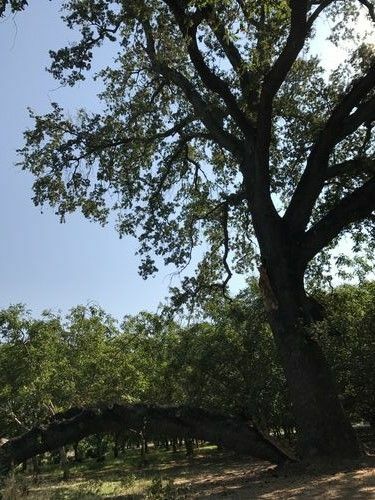 There’s actually several oak trees on our property that are getting diseased and will probably be taken out within the next 3-5 years. Would straight limb pieces from black walnut be very problematic as well, or is that more of an oak issue?Or is the major issue with that oak limb that it’s got a lot of curve in it that translates into major stress and energy build up within the grain? The reason I ask, is becsise I got two nice, straight walnut logs that are about 9 ft long and two feet in diameter. I was hoping to cut them in to slabs too. Thanks for you input. I’m pretty new at this, but I love it. I love hand planing wood and messing around with my grandpas hand tools. It’s so fun building stuff and being creative. It’s hard to tell if wood is going to have stresses. There’s going to be some amount of stress in most of my milled lumber, so I just assume it’ll be there. As for your Walnut, I’d go ahead and mill it.